If an administrator wants to add an employee to the project, but not a floorplan, they can by using the Staff tool in the Sidebar Menu. In the Sidebar Menu, select Staff. In the Staff List select the Add button. Enter the employee's first name and last name. If you want the employee to be able to login, enter a username and password. Add a Security Group to limit what this user will be allowed to do in the project. 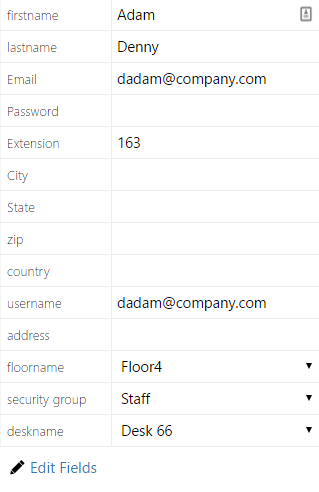 Add a Floorname to add a Employee panel of for this user on the selected floorplan. Add an Address to display where this user is geographically on the Map floorplan. Click the green + icon to add an employee picture. 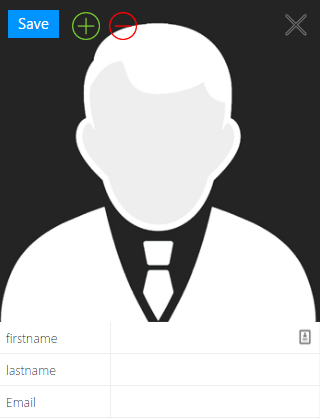 Click the red - icon to remove the employee picture. Select Save to add the new Employee to your project. Note: Custom fields can be added to the Employee Detail by clicking Edit Fields. See Adding a Custom Employee Field.